Bethpage Ballpark, located in Central Islip, is a 6,002 seat state-of-the-art facility that is home to the Long Island Ducks. The ballpark opened on April 28, 2000 with great fanfare to a past-capacity crowd. It has welcomed over 7 million fans and hosted more than 670 sellouts since. Among its many features are 20 luxury suites, spacious seating, a 126-seat bar/restaurant and an indoor batting tunnel. When shovel hit dirt in 1999, the original name of the Ballpark was Suffolk County Sports Park. 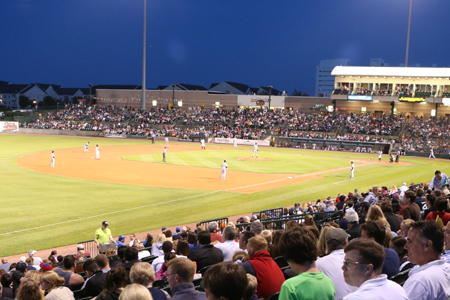 In 1999, European American Bank ("EAB") purchased naming rights from the ballpark's owner, the County of Suffolk, and the ballpark was christened "EAB Park" upon opening in 2000. The name stayed the same from Opening Day 2000 until EAB was purchased by Citibank in 2001. The ballpark was then known as 'Citibank Park' from 2002-2009. In 2010, Bethpage Federal Credit Union entered into an agreement with the County of Suffolk and has owned naming r ights since. 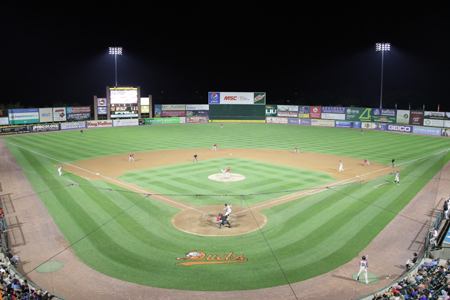 In 2017, Suffolk County Executive Steve Bellone, the Long Island Ducks and representatives from the Suffolk County Department of Public Works unveiled a brand new LED field lighting system for the ballpark. The six towers that light the playing field were installed by Musco Lighting and replaced the 2000-Watt Metal Halide bulbs that had been lighting the field since the Ducks' inaugural season. In addition to significant energy savings, the new LED lights provide the perfect illuminance for both the spectators and players. Additional ballpark enhancements made in 2017 included the installation of a new Kentucky Bluegrass playing surface, as well as the refurbishments of the luxury suites, the restaurant, and the suite level restrooms. In addition to Ducks baseball, Bethpage Ballpark has hosted thousands of events since opening. Professional soccer, lacrosse, the Freedom Fest concert, charitable events, corporate events, high school baseball, youth camps and clinics, three Atlantic League All-Star Games (2002, 2010, 2018) and seven Atlantic League Championship Series have taken place on “The Pond”.